Monica Margaret McKenzie was born in Blackall, Queensland to George and Rebecca (nee Hall) McKenzie on January 16, 1929. Monica was the fifth child in a family of six – two boys and four girls. Monica’s father was a small-hold grazier in the Blackall area and her childhood was spent in the serene surroundings of country life where she experienced a great deal of love, stability and support within a loving Catholic family. Because the family lived in an isolated country area, Monica and her younger sister, Colleen, received their primary education from the Queensland Correspondence School and were supervised by their elder sister, Nettie. Speech and drama lessons were also given by Nettie to several children in the town and Monica and Colleen joined these classes. They sat for examinations in the Trinity College of London and performed end-of-year plays. This gave Monica a life-long interest in drama and literature. 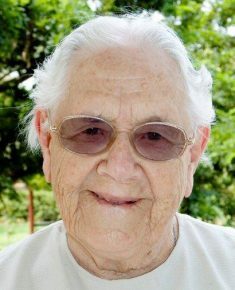 Monica completed her education as a boarder at All Hallows Convent, Brisbane where she gained the Junior Certificate in 1946. She also studied speech and drama as well as music and singing. In 1947 she won an Australian Music Examinations Board award for the highest mark in singing in Queensland. Monica remained at All Hallows teaching speech and drama after she completed her studies, and at this time she was offered a position at St Mary’s College Charters Towers. It was at St Mary’s that Monica met the Sisters of the Good Samaritan for the first time. In 1948 Monica applied for admission to the Good Samaritan Novitiate at Pennant Hills. She began a new phase in her life when she joined several other young women on July 2 in that same year, and was given the religious name Sister Louis Marie. Later she reverted to her baptismal name, Monica. On January 6, 1951, Monica made her profession of vows and moved to St Scholastica’s Convent where she was appointed to the staff of St Scholastica’s College and continued her musical studies there under Sister Mary Justin Simonds, and later Patricia Comerford, Justina Corcoran and Margaret Mary O’Donnell. For the next 24 years Monica was engaged in a ministry of education which included music, speech and drama and singing tuition in NSW, the ACT and QLD. During this time Monica contributed greatly to College life, producing several musicals and preparing choirs for school and church functions. Monica had great passion for providing education even for the most challenging of students. Whilst in Queanbeyan she became aware of a significant number of students who had dropped out of secondary education and she applied for a government grant and created an alternative after hours school program that became highly successful in giving these students a good education. From 1983 she also taught music at Santa Maria College Northcote for four years. During 1975 Monica attended the National Pastoral Institute in Melbourne where she studied adult education and liturgy. Living and teaching in Queanbeyan in the ’80s, she gained her Bachelor of Arts and Bachelor of Education and had completed her Masters Degrees in both these faculties by 1995. Along with her great love of learning, Monica had a deep pastoral concern and her empathy and her bedside vigil for our sisters who were dying is well known. Moving to Melbourne she lived firstly at Northcote and Preston, before transferring to Mulgrave in 1991, where she spent ten years at Mannix College. Here she became a highly respected tutor not only for her expertise but for her compassion and concern for the students. Finally, in 1997 living at Pakenham, she undertook pastoral and community visitation. Here she was able to indulge her love and talent for gardening but she also lectured in philosophy for the University of the Third Age, Pakenham. She prepared for this thoroughly each weekend and gave great enjoyment to her classes. Monica enjoyed being a participant in the Parish of St Patrick’s. When Pakenham became the residence for many Sudanese refugees, Monica’s compassion and capacity for practical support of those in need was truly evident. She assisted families in enrolling children in the schools of their choice, ensured they had proper uniforms and books and continued to monitor their progress and that of the families. Many hours of her time was devoted to supporting families to complete complex documentation associated with achieving settlement in Australia; extricating youngsters from problems with the law; and travelling kilometres to engage with solicitors on their behalf. The lengths she went to and the travel undertaken on their behalf were quite extraordinary. In 2016 she retired to Marian House Northcote where she remained until December 18, 2017. Monica is survived by her sister Colleen Skews and four nieces and one nephew and their families and remembered with love and gratitude by all her Good Samaritan Sisters.